Milogold in game: 3,386 Who? Important notice! Pokemon Milogold is a fictional character of humans. It evolves from Feebas when leveled up with its Beauty condition high enough or when traded holding a Prism Scale (Generation V onwards). Milotic is an aquatic, serpentine Pokémon with a primarily cream-colored body. It has red eyes with long, pinkish antennae above them. Additionally, there are long, hair-like fins above its eyes, which begin thin and thicken towards the tips. 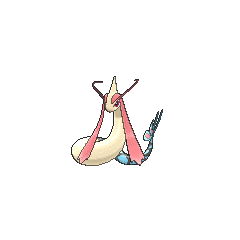 These eyebrows extend to almost half of Milotic's body length, and will be longer on the female than the male. On top of its relatively small head is a straight spike. Running down either side of its neck are three black dots, similar to gills. Its lower body is a patterning of blue and pink, diamond-shaped scales outlined with black. The tail consists of four large, blue fins with pink ovals in their centers. Each of the tail fins overlaps the next slightly, causing it to resemble a fan. 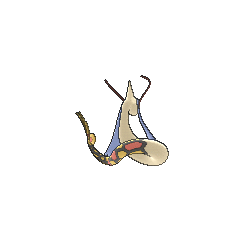 While it has not been depicted, Milotic's scales are said to change color depending on the viewing angle. Milotic first appeared under the ownership of Robert in Win, Lose or Drew!. 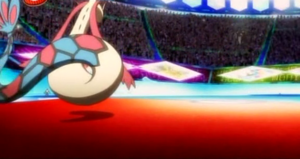 Robert used Milotic again for the Hoenn Grand Festival. Juan's Milotic was first seen in The Great Eight Fate!. Juan used it against Ash for the Gym Battle in the following episode, being his strongest and last Pokémon. Pike Queen Lucy used a Milotic to battle against Ash's Donphan and Pikachu in Queen of the Serpentine. Lucy's Milotic defeated the former of the two and lost to the latter. In Malice in Wonderland!, a Feebas under the ownership of Johanna evolved into a Milotic, though it was only an illusion composed by Mismagius. A Milotic appeared in Our Cup Runneth Over! under Wallace's ownership as his main Contest Pokémon. A Milotic also appeared in the opening of Arceus and the Jewel of Life, under the ownership of Tower Tycoon Palmer battling against Cynthia's Garchomp. Another Milotic appeared in the beginning of Zoroark: Master of Illusions. A Milotic appeared in SM005. 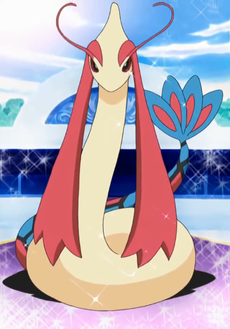 Ruby's Feebas evolved into Milotic after Ruby declared that it had inner beauty in the climax of the Ruby & Sapphire chapter. 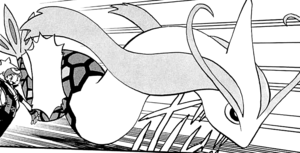 Emerald encountered a wild Milotic in the 21st room of the Battle Pike but he simply ran away from it due to the fact that it was a wild Pokémon. Later on in the challenge, Pike Queen Lucy sends out her Milotic against Emerald's Starmie. Cynthia has a Milotic that was first used against Cyrus in the Team Galactic HQ. 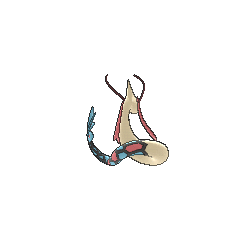 Milotic may also be a Contest version of Gyarados since it was introduced in the third generation with Pokémon Contests. 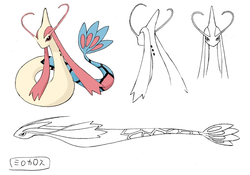 This is fortified by Milotic's emphasis being on its beauty, while Gyarados' emphasis is on its power. 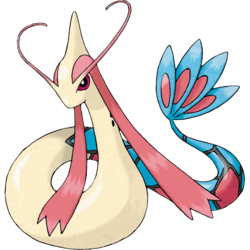 Milotic may be loosely based on sirens or the Loch Ness Monster, but mostly has characteristics of a sea serpent or sea dragon. Its pale, elongated body and extended, red dorsal fins are reminiscent of an oarfish.